mSpot has been streaming full-length movies to cellphones for a few years now, but not until this week has the company had a potential customer base of 40 million. As of right now, mobile phone users on Sprint, AT&T, Verizon Wireless and T-Mobile (yes, that includes the G1, Pre, iPhone and every other smartphone with a half-decent browser) can surf over to m.mspot.com in order to stream major motion pictures, and being that the service is on-demand, you can also pause and restart 'em whenever you darn well please. Deals have been inked with Paramount Studios, Universal Pictures and the Weinstein Company, and we're told that more agreements are in the works. 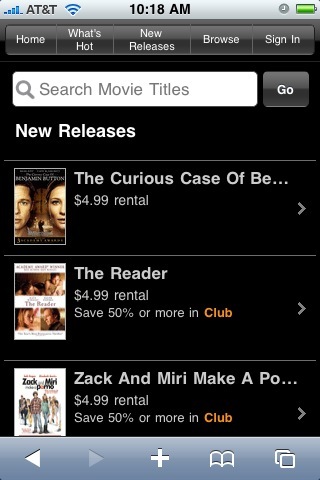 Movie rentals will cost $4.99 per title, and can be viewed from 24 hours to 5 days after they're rented. Naturally, mSpot recommends paying for an "unlimited" data plan, and if you're smart, you won't utilize the service whilst traveling abroad. mSpot brings new release movie streaming to major US carriers originally appeared on Engadget Mobile on Wed, 30 Sep 2009 11:34:00 EST. Please see our terms for use of feeds.